The ring is his home. It’s the place he feels in control. Zeke ‘The Storm’ Raine has his life all planned out. The plan was working, it’s almost his time to shine, to be the ultimate. One moment was all it took to bring it all crashing down around him. One punch, one moment of distraction, one mistake by another and his dream could be a faint memory. Bryce Tanner, one time fighter and now the coach Zeke doesn’t think he needs. Moving to a new country to take this job, and he's determined that he will succeed. Now that he's met Zeke, Bryce must make his own plans, rules that he is going to have to work hard to stick to. He just doesn’t know if he will be able to resist. Passions run high, making their professional relationship difficult. Can they keep the outward façade while becoming more? Now Zeke needs to decide, is he willing to walk away from what he loves? Will he be able to win the most important fight of his life? Warning: Contains both m/m and m/f scenes. Not suitable for younger readers due to sexual content. I really enjoyed this book. I am not gonna lie, I really didn't like Zeke for most of this book. I thought he was pretty arrogant and just generally not nice. Bryce, on the other hand, I loved from the very start. I thought they worked well together and they had pretty hot chemistry. It was a good story that kept me interested all the way through. Well done T.A. McKay on your first M/M book. My other loves include music and reading (in case I haven't mentioned that before) and then when I have time a little more reading. I think if I could read for a living I would, but since I can't I will continue on the writing side of things. 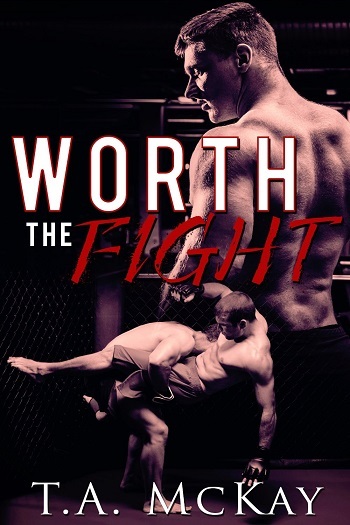 Dawn reviewed her personal copy of Worth the Fight (Hard to Love #1) by T.A. McKay for this post.